I’ve become a very last-minute addition to the roster at this year’s Sacred Space Conference in Laurel, MD. I will be presenting yoga classes Friday, Saturday and Sunday morning at the Conference. If you’re there, I hope to see you! If you don’t have anything going on, passes are still available at the door. In the myths of the cultures we sprang from, new light is on its way. The days are short and the nights long; the cold keeps us indoors and it’s all too easy to fall into brooding and retrospect. The wheel of the year is winding down, turning toward its end. And though we throw wide the East Gate soon to let in new light, that time is not yet here. This space of darkness and reflection has its own value. With each year, we gather to ourselves more memories, more experiences, more feelings. Some joyous, some sad. We learn, we grow, we change. And as we fill the pages of this year’s book, the sorrows and challenges can weigh heavy on our spirit. The last new moon of the year is fast approaching. It falls on Thursday, December 13th, this year. Why is that important? The transition of darkness to light in the lunar cycle is a good time for releasing. As the final cycle of its kind of 2012, this upcoming new moon offers us a unique opportunity. What do you carry that no longer serves? What injuries have you taken on this year? What relationships have become toxic? You have a chance to release those dark pieces into the endless night and begin the coming year with a blank slate. This can be as simple as offering up your burdens in prayer, writing them on a piece of paper and setting that paper alight, or performing a full-fledged releasing ritual. You can take this opportunity to purify your home, releasing the gathered energies of the last year. You can also use this new moon to further your work on changes already underway. I am working on releasing guilt. I struggle with feelings that I am not good enough, that I don’t do enough, help enough, work hard enough. I fight against my humanity and the finite nature of my time and energy. I beat myself up for not meeting the unrealistic ideal I carry within me. And I am trying to change that behavior. As part of my own releasing, I will be getting a tattoo that symbolizes allowing my true nature, imperfections and all, to be what it is without self-punishment. There is a Navajo word, ‘hozro’ that translates, roughly, to ‘moving with the current flow of energy.’ Rather than struggle in this season, allow the energetic current to carry you. You can travel this river into the night and back out again. You can release the burdens you no longer wish to carry into those dark waters and turn to face the dawn lighter and more ready for the adventures to come. May the flow find you, may it bear you up, and may it carry us all into the light of the coming year renewed. In Labyrinth Walking terminology, a Labyrinth is a single meandering path that winds from an entry point to the center of the design. There is only one path–the same walk is taken on the return trip from the center to the entry point (now the exit). There is only one path. There are no turns or dead-ends as in a maze, and nothing designed to confuse or bewilder the walker. To walk a Labyrinth, you simply start walking between the lines and follow your feet. Although the path winds toward the center and back out again, you never have a choice to make about the direction you’re going. That single path holds true. Although each of the above Labyrinths have unique characteristics, they all share the most fundamental trait: there is only one path. Because of the single path, if you decide to walk a Labyrinth as part of a group (at an open Labyrinth Walk, for instance), you will encounter other people along your route. Labyrinth walking as a group is a cooperative experience–to allow someone else to pass, you can simply step out of the way, then back to wherever you were on your path. Everyone shares that single route. The Golden Rule of Labyrinth Walking is “There is no wrong way to walk a Labyrinth.” You can set any pace you’d like–you can walk slowly and meditatively, at your usual walking pace, at a good clip…you can even dance or run through the Labyrinth. It’s all up to you. You can enter the Labyrinth with a specific thought in mind to contemplate, you can carry a prayer with you, you can enter in joy, grief, or pain, or you can wander in with no expectations or plans at all. All ways to move within the Labyrinth are correct. A lot of things can happen during a Labyrinth walk. If nothing else, if you walk in with no expectations, you will walk out feeling more relaxed than when you entered. However, many other things are possible. You might realize the solution to a problem you’re facing or change your perspective on a situation. You might find a creative block suddenly loosened. You might find yourself connecting deeply with Spirit, whatever form that happens to take for you. Many people pray on a Labyrinth walk. Occasionally, we find ourselves walking with the souls of those who have passed on before us. Surprising things can happen. We calm down, gain insight, figure out solutions…the possibilities are endless, and endlessly individual. Everyone gets something unique to them out of their walk. One of my favorite quotes from ‘The Sacred Path Companion’ (the workbook for ‘Walking a Sacred Path’, both by Lauren Artress) is “The Labyrinth meets you where you are, gives you what you need, and nurtures a web of interconnection.” Every Labyrinth walk I take or facilitate underscores that quote more deeply. There are some fairly widely-accepted principles that can help you get the most out of your walk. Remember, what follows are simply suggestions. When walking a Labyrinth, the most important guidance to listen to comes from within you. Take a moment to clear your mind and become aware of your breath. You may want to spend some time around the outside of the Labyrinth before you begin. When you feel ready, enter the Labyrinth, find your own pace and follow the path. Allow yourself to find the pace your body wants to go. If you meet someone on the path coming the other way, simply turn slightly or step off the path and allow each other to pass. If you wish to pass a slow walker, or help others pass you, it is easy to do so at the turns. There are places to step off and pause if you need more time along the way. The center of the Labyrinth is a good place to pause and reflect, sitting or standing or kneeling, before retracing your steps on the path that now guides you out of the Labyrinth. A Labyrinth walk is a journey, not a race to get to a destination. You are welcome to take all the time you need. What happens at a Labyrinth Walk? 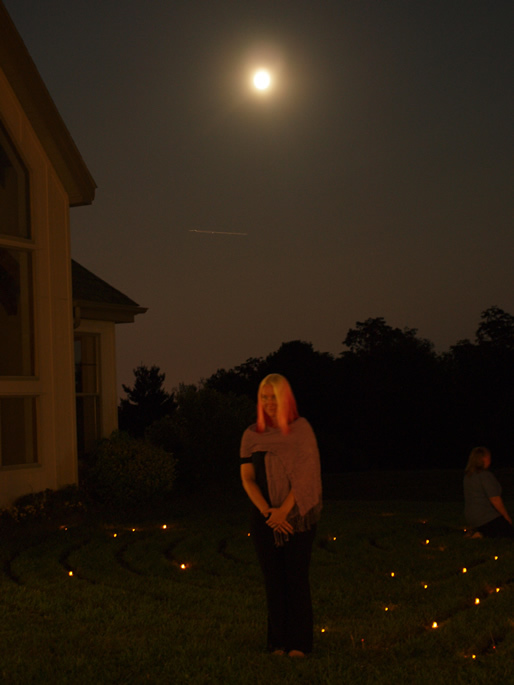 An open Labyrinth Walk is a great way to begin your Labyrinth practice. 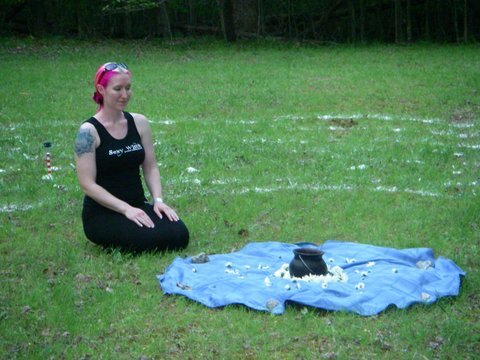 Depending on the location and layout of the Labyrinth, and whether there are any facilitators present, open walks can vary a bit. 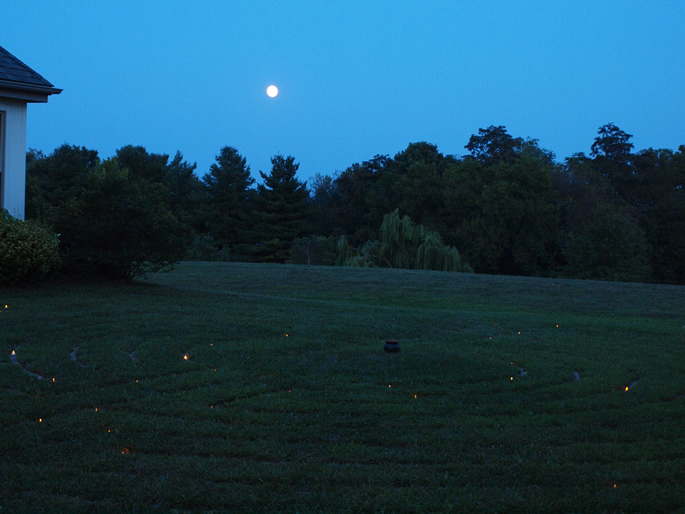 I’m going to recount what you’ll experience if you come to one of the Open Full Moon Labyrinth Walks that I facilitate at the Unitarian Universalist Congregation of Frederick. At the UUCF, we walk at night, after the sun has gone down. We have two Labyrinths we use, an indoor one and an outdoor one. Which one we use is dependent on time of year and climactic conditions. (The next open walk I’m hosting will be on the indoor labyrinth–it’s getting chilly out there!) 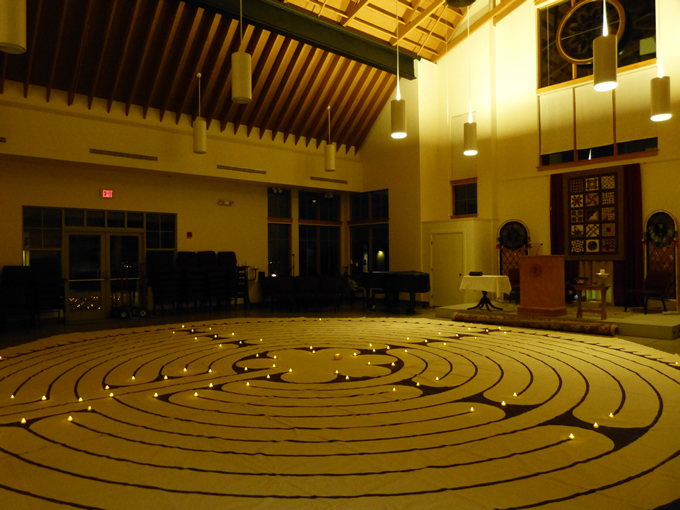 The indoor Labyrinth is a Chartres-style canvas Labyrinth that we roll out in the sanctuary. 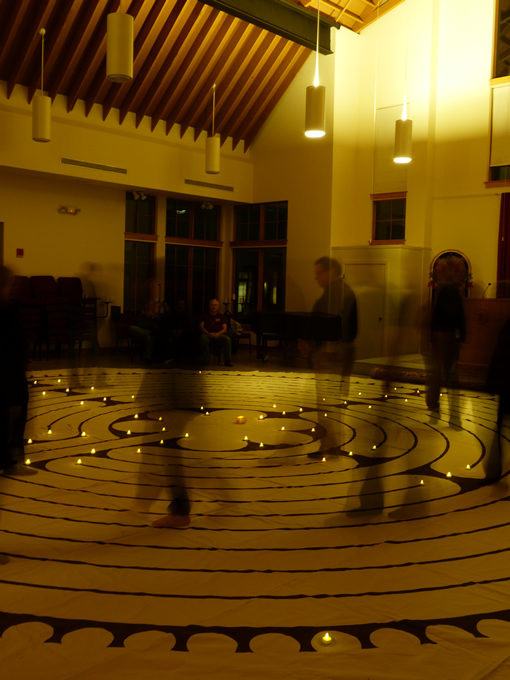 The outdoor Labyrinth is a contemporary Labyrinth designed specifically for the church by John Standing Bear. It is laid out in brick on a grass courtyard. The Labyrinth is marked with flickering LED tealights. They help show you where the pathway leads. If you arrive after the walk has begun, you’ll find that it’s pretty quiet. Labyrinth walking is a meditative activity, so it’s customary to keep the noise down in order to give everyone time with their thoughts. If people do want to talk and socialize, however, they’re more than welcome to do so elsewhere on the property. I stand at the entrance to the Labyrinth. My purpose there is simple: since we all walk the same path together, it’s easy to have a ‘traffic jam.’ I help put space between people as they enter the Labyrinth so that while you walk, you have a chance to focus inward rather than worry about stepping on the person in front of you. I’m also then available to answer questions or help out anyone who needs extra assistance for their walk. The number of people at a Labyrinth walk can vary greatly depending on the time of year. At a guess, we’ve had as many as 40 and as few as 10 at past Labyrinth walks. After I welcome you onto the Labyrinth (generally done with a gesture in order to maintain silence), you’ll probably end up passing a couple people who are on their way out. You may also find that when you come to the center, there are a few other people seated in meditation there. Everyone is very good about being respectful of each others’ space. This is the aspect of Labyrinth Walking that fosters community. A Labyrinth Walk can be deeply personal and cooperative at the same time. On your return journey, you’ll again pass other walkers. After you walk out of the Labyrinth, you’re welcome to sit down and journal or think about your walk. There are benches at the outdoor Labyrinth and seats placed around the perimeter of the indoor one. You can sit and contemplate, move to an area where conversation is welcome to chat about your experience, head home for the night or walk a second (or even third) time. During the warmer months, we welcome hand drummers to play during the second half of the Labyrinth walk. Drums add a different energy to a walk. Where a silent walk is contemplative, a drumming walk is jubilant. People dance and twirl on the Labyrinth, clap their hands and sometimes sing or chant. That’s why we only have drums during the second half of the walk. It allows walkers a choice in terms of what kind of walk they’d prefer. Many walkers, myself included, do both. At the end of a walk, after the last walker leaves the Labyrinth, a few people generally stay and help clean up the tealights and move chairs if we were using the indoor one.